How does NOVAM change the game of IoT security? IoT security is a realm where size does matter. As devices proliferate our refrigerators, microwaves, and thermostats just get smarter. In the world of the enterprise, they have your laptop covered and the servers are well monitored. What about the edge? The edge where IoT devices live and multiply, and are often forgotten. Like the frozen tundra of the Antarctic, you know it is there, but have you ever seen it? IoT devices are like stars in the sky: each one is different. How do I gain visibility of all those devices? The typical tools cover what we know, the core of the networks that serve as the lifeblood for the internet, but fail us when we embrace the diversity of IoT. People know a problem exists, but how do you solve it? There are thousands, if not millions, of different IoT devices out in the world how do I have any idea what is going on with them? At NOVAM we want to solve this problem. Our experience has shown that these vast networks of IoT devices lack visibility and without that very little can be known about the overall health of these devices. 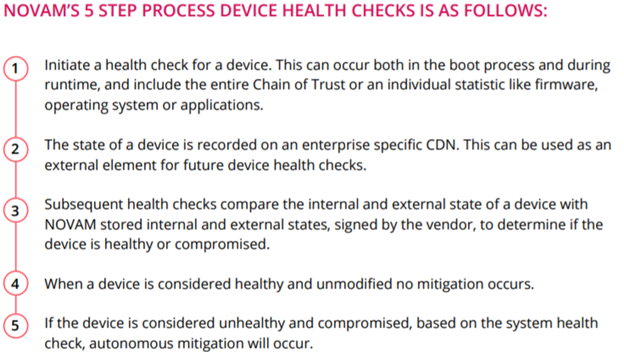 NOVAM developed a health check protocol to solve the problem of visibility, audit capabilities, and remediation of devices. NOVAM wants more than just visibility, but the opportunity to create audit trails using distributed ledger technology. NOVAM also sees an opportunity to remediate these ever-expanding IoT devices in the event of a security incident. NOVAM armed with the new patent-pending protocol gives the enterprise the ability to fight back against the ever-increasing threat landscape. Act and don’t react to the expanding universe of IoT devices and the growing security threat of the unprotected device. NOVAM’s automatic remediation functions will leverage firmware and software provided by clients, businesses, and organizations to ensure complete and correct updates.